I know this looks like a pile of sick, but for once I can’t blame my poor photography skills because it really did look like a pile of sick. There really didn’t seem to be any other way to present it. Maybe I could cut out a perfect square but life’s too short when there’s lasagne waiting to be eaten! But no matter what it looked like because it tasted great! My husband isn’t particularly fond of butternut squash and I’d had one sitting around for a while. He was out so I decided to try out the recipe for butternut squash lasagne from Yellow Rose recipes. It took quite a few steps so it’s not one to whip up when you get in late from work but on a Sunday afternoon it was fine. It was quite an unusal recipe in that the filling was also blended into the sauce. This made for a very rich creamy lasagne. The filling is roasted squash, onion, garlic and sage mixed with tofu, and the sauce is a vegan bechamel with some of the squash blended into it. 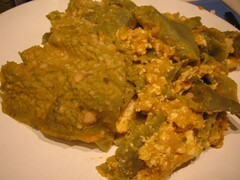 I used spinach lasagne sheets which accounts for the pukey green bits on the picture. Next time I’d make a couple of modifications to the recipe – I’d put some lemon juice in there somewhere to cut through the sweetness a bit and I’d add a bit of cayenne or chilli powder into the sauce. But otherwise it was a great new way to use butternut squash. I like this book! This entry was posted in Yellow Rose Recipes by efcliz. Bookmark the permalink.